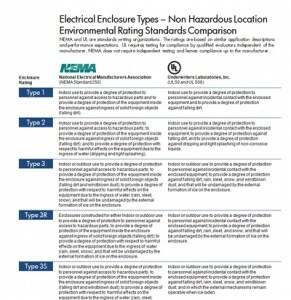 Here’s a side-by-side look at the environmental ratings between the National Electrical Manufacturers Association and Underwriters Laboratories, Inc. for electrical enclosure types in non-hazardous locations. NEMA and UL are standards writing organizations. NEMA provides a forum for the development of technical standards that are in the best interests of the industry and users, advocacy of industry policies on legislative and regulatory matters, and collection, analysis, and dissemination of industry data. UL is a global independent safety science company with more than a century of expertise innovating safety solutions from the public adoption of electricity to new breakthroughs in sustainability, renewable energy and nanotechnology. Dedicated to promoting safe living and working environments, UL helps safeguard people, products and places in important ways, facilitating trade and providing peace of mind. The ratings shown below are based on similar application descriptions and performance expectations. Underwriters Laboratories requires compliance testing of electrical enclosures by qualified evaluators independent of the manufacturer. To help ensure adherence to prescribed manufacturing methods and materials specifications, UL sends site inspectors to manufacturers. NEMA does not require independent testing and leaves compliance up to the manufacturer. Nema Enclosures designs and fabricates quality NEMA and UL rated stainless steel and aluminum electrical and instrument enclosures to your exact specs & that meet your lead times. We believe that by thinking about your enclosure needs while you’re configuring what goes into it will save you time, money and frustration. This entry was posted in enclosures. Bookmark the permalink. © Copyright 2017, Nema Enclosures. All Rights Reserved.